The point is: I guess it’s now baseball season? I mean, I’m as big a fan of the sport as it gets, but this archaic thinking that the NFL and MLB have some sort of Sun and Moon relationship is pretty dumb. Have you seen the NBA news wire the past seven days? I have a feeling I’ll be more captivated by those ongoing sagas than Grapefruit League at bats in two weeks time. Still, let’s humor Rob Manfred and Co. by focusing this edition of “Around the Thorne” on a few of the most interesting baseball stats I’ve recently come across. While the inability of MLB teams to sign top free agents Manny Machado and Bryce Harper has mostly dominated the headlines, it should be noted that the Marlins have yet to find a partner for a J.T. Realmuto trade despite the organization more or less going door-to-door with the catcher’s services. However, regardless of the uncertainty, Realmuto remains, on average, the first backstop going off the board in NFBC drafts. Realmuto carries an ADP of 57.0, just barely beating out Yankees C Gary Sanchez – coming off a nightmarish 2018 campaign. Aside from positional scarcity, the reason for this is simple: it doesn’t matter where the soon-to-be 28-year-old is dealt because anywhere would be better from a fantasy perspective than Miami. I’ll repeat. Literally anywhere. The bar was just set so low with Marlins Park last year. According to Baseball Prospectus’ metrics, the Marlins’ home stadium ranked as the worst place for right-handed batters to hit by both Home Run Factor and overall Runs Factor – a trend we can clearly see in Realmuto’s environment splits. Now, it’s not as if a .773 OPS or .175 ISO are poor by any measure; it’s that those umbers look incredibly mundane when directly juxtaposed to Realmuto’s road figures of .870 and .236 in 2018. In fact, specific to right-handed pitching, Realmuto’s preferred opposition, the catcher has produced an astounding 153 wRC+ away from Miami across each of the past two seasons. That’s an elite batting profile. Yet, ball park isn’t the only concern. Team construct is also a major issue heading into April for Miami. The Marlins were the lone team in baseball to score fewer than 600 runs last season, becoming the first squad since the 2015 Braves to not cross that threshold. Not surprisingly, this inefficiency had an immense impact on Realmuto’s potential fantasy output. Though the catcher took a massive 87.6 percent of his plate appearances as either the second or third hitter in Miami’s batting order – each an optimum and high-leverage lineup spot – he managed only 115 PAs with runners in scoring position. Of the 172 qualified players in this field, only Billy Hamilton and Kurt Suzkui came to the dish in RBI situations less often. At this point, all we can really do is hope for Realmuto’s escape. 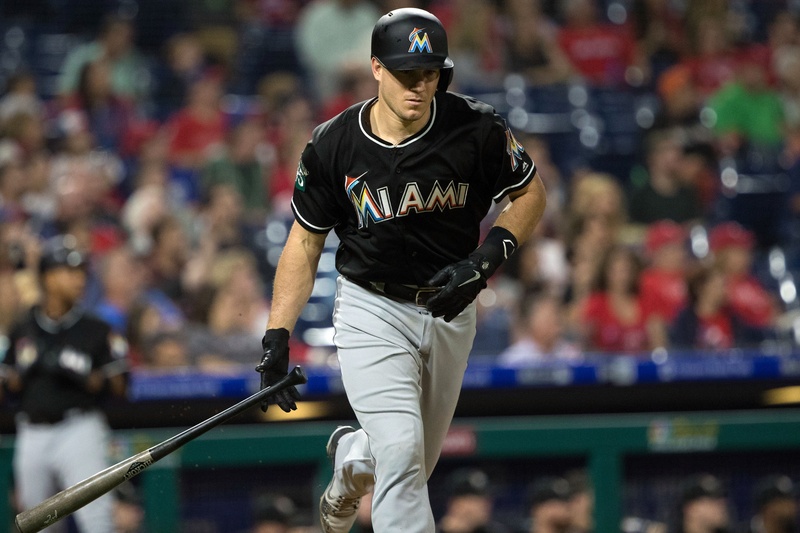 Editor’s note: Realmuto has reportedly been traded to the Philadelphia Phillies. It would be an understatement to say that Randal Grichuk had an odd 2018. First and foremost, the outfielder was traded from St. Louis to Toronto in the winter, sparking a bit of intrigue throughout the fantasy baseball community. You see, Grichuk has always been a bit of an advanced statistics darling. In the four years we’ve been keeping track of barreled balls, Grichuk has found himself inside the top 10 of barrels per plate appearance by season’s end on three separate occasions. That puts him in some rarefied company, specifically with the likes of Giancarlo Stanton, J.D. Martinez and Nelson Cruz. However, unlike those distinguished gentlemen, Grichuk’s raw numbers leave something to the imagination. His inclusion in that category of hitter is purely hypothetical as he’s yet to even cobble together a season with 500 PAs. Most of this isn’t really the 27-year-old’s fault, though. Aside from calling an often crowded Cardinals’ outfield home for most of his career, Grichuk has also been bitten by the injury bug. 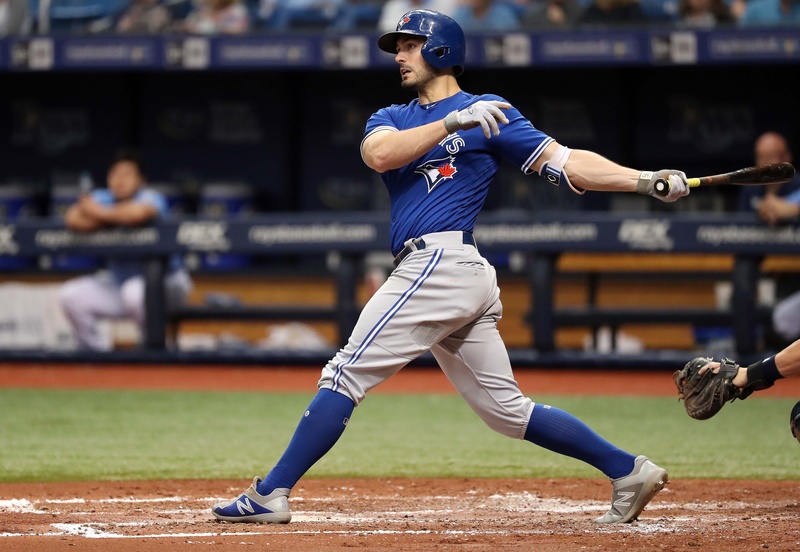 It was health that actually once again limited Grichuk to only 462 plate appearances in his inaugural campaign with the Blue Jays – a freak knee issue that cropped up after attempting a diving catch – yet, the case could also be made that this ailment turned his season around. At the time of the incident, Grichuk was slashing an ugly .106/.208/.227 with a wRC+ of 20. Honestly, if the DL time didn’t cost him at bats in the month of May, he likely wasn’t far from losing them purely based on performance. Then, after reestablishing his mechanics in a minor-league rehab stint, Grichuk came out scorching hot to begin June. He never looked back. From the time of his activation from the disabled list, Grichuk possessed a .282 ISO with a .553 slugging percentage and a 134 wRC+. He hit 23 home runs in only 385 plate appearances, a direct result of a 44.0 percent fly ball rate paired with a 51.3 percent pull rate. Essentially, he did what he’s always done, as there was nothing in either of his GB/FB ratio of HR/FB ratio to suggest that this four month stretch was an outlier. Every time I see Grichuk’s batted ball profile I’m reminded of Khris Davis circa 2015. Brewers OF Khris Davis, who knocked out 27 long balls in 440 PAs. As soon as Davis moved to Oakland and found a steady diet of at-bats, he’s been a set-in-stone 40-plus home run threat. Grichuk has that opportunity in Toronto. There’s no one waiting behind the curtain to steal plate appearances on a roster devoid of much premium MLB-level talent. If he can simply stay upright in 2019, he’ll go deep at least 35 times. At his current ADP, that’s a steal. There’s generally an archetype of player at a certain ADP that I shy away from. The best and most recent example of these precise conditions occurred last season with Jonathan Schoop; a free-swinging batter coming off a career-best campaign. That’s not to say that Schoop’s aggressiveness at the plate is necessarily a bad thing, especially in the vein of fantasy, but that type of approach tends to bring with it a high variance of outcomes. That’s not usually what I’m looking for in an asset going just outside the first 50 selections of a given draft. 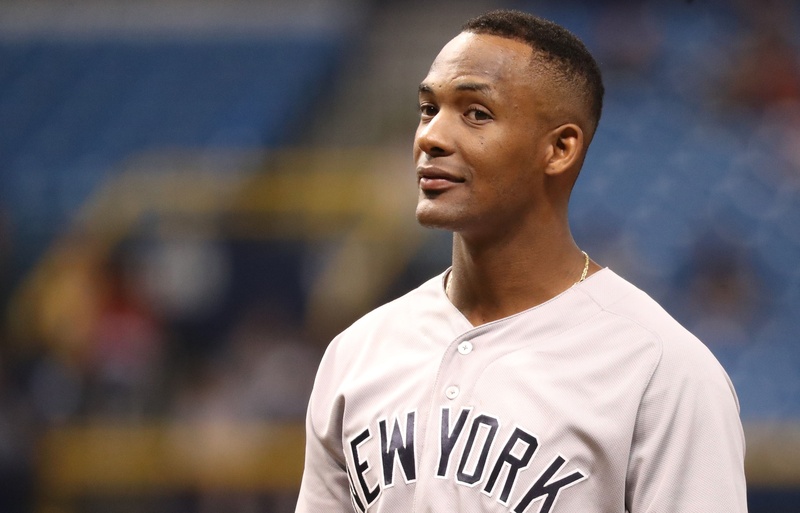 In any case, Miguel Andujar would appear to be 2019’s Schoop. A man currently being taken around pick 60 who’s 43.7 percent outside the zone chase rate in the second half of 2018 was the second-highest mark in the entire league. Yet, despite the obvious similarities on the surface, I can’t seem to shake my adoration for Andujar. The sophomore simply presents a very unique ability to make quality contact on poor pitches. Consider that the only other player to sit inside the top 10 in outside the zone swing rate and sport an overall contact rate above 80.0 percent is the light-hitting Dee Gordon. However, where Gordon’s isolated power over the second half of last season was a microscopic .113, Andujar’s was an elite-level .256. In fact, aside from Anthony Rizzo, no qualified hitter possessed an o-swing above 37.5 percent, a single-digit swinging strike rate, and an ISO above .200 in that span of time. That’s the difference between Andujar and Schoop. There’s no swing-and-miss in the Dominican native’s game, just swing. Again, none of this would matter if Andujar’s aggression wasn’t also producing results; but, if anything, he developed an even more enviable batted ball profile over the final three months of 2018. After posting an underwhelming 1.46 GB/FB ratio prior to the All-Star break in his rookie season, Andujar actually hit more fly balls than ground balls in the second half, leading to a home run once every 16.9 at bats compared to one every 26.6 at bats in the first-half. From July 17 on, Andujar’s .575 slugging percentage was the 11th best mark in all of baseball. 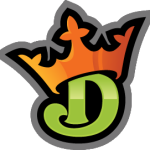 His .383 wOBA tied him with fellow wunderkind Juan Soto – who happens to have an NFBC ADP of 31.1 if you thought Andujar was the only young player flaunting an expensive price tag on draft day. The point is, not all fervent activity at the plate is a bad thing. We can’t all be Joey Votto. Just so long as one isn’t Schoop, either.